When homeowners require sewer pipe repair or replacement services, they frequently pay steep bills for pipe excavation. 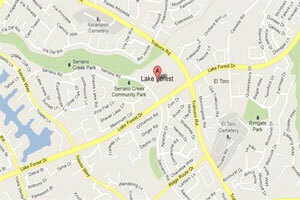 We offer Lake Forest trenchless sewer repair. This new service reduces the need to excavate (saving you money)! Visit us here at Scott English Plumbing, Inc. at Suite “H”, 1230 North Jefferson Street in Anaheim, California. Or simply call us at 714-987-9801 to request reliable Lake Forest trenchless sewer repair services 24/7! Residents of Lake Forest trust Scott English Plumbing, Inc. for experienced, skilled plumbing assistance. We supply high-quality customer service. Our customers matter to us. Ask us for help solving leaky water and sewer pipe problems. The new PermaLiner trenchless sewer replacement technology interests many customers. It offers a way to replace sewer pipes without digging up yards and driveways. This generally means plumbers replace damaged sewer pipes while minimizing customer inconvenience and avoiding some repair expenses. Also, trenchless sewer repairs and replacements can be done in days, whereas traditional repairs can take weeks to months. Save money and time with PermaLiner trenchless sewer replacement services in Lake Forest today! Does your home require sewer replacement services? Consider asking for Lake Forest trenchless sewer replacement assistance! In some cases, this service saves customers a lot of money. When available, trenchless methods for replacing sewer pipes allow plumbers to install new sewer lines very cost-effectively. You won’t need to pay an excavating crew to dig a new trench to replace residential sewer pipes anymore! Did you know, we offer no-dig trenchless sewer repair in Lake Forest? This service delights our customers. When possible, we’ll help you avoid the expense of digging through the ground to repair leaks in sewer lines. We seek to use this new technology as our first choice for fixing many types of sewer pipe leaks. The bottom line: CIPP (cured-in-place pipe) helps save customers money. Homeowners avoid paying for extensive excavation services. They usually don’t need to replace damaged lawns, gardens, patios or driveways. They prevent inconvenience caused by sewer pipe excavation. We prefer to use CIPP for sewer pipe repairs whenever possible! Schedule Lake Forest Trenchless Sewer Repair Today! Does your home’s sewer line require repair or replacement? Go ahead and call 714-987-9801, 24/7 for assistance. We’ll schedule a service appointment to check the plumbing system in your home and provide you with an estimate for our no-dig trenchless sewer replacement services in Lake Forest!